Allen Cochran has been in the stone masonry business for more than 30 years, apprenticing in time-honored methods for four years before founding Cochran’s Stone Masonry. Honored by the Loudoun Preservation Society in 2018 as Preservationist of the Year, Allen has extensive knowledge of historical preservation and the construction methods of historic structures. Increasing his expertise, Cochran has constructed his own lime kiln and developed many traditional lime and clay mortars that match period-constructed buildings. Cochran's Stone Masonry offers workshops, and Allen teaches a traditional lime mortar course for the Waterford Foundation in Waterford, Virginia. Allen Cochran in his showroom in the former Janney store in Lincoln, Virginia. Allen Cochran grew up in this 1765 stone building, originally the second of three Goose Creek Friends meetinghouses. His parents still live here. The third meetinghouse, built of brick in 1815, is located across the road next to a historic one-room schoolhouse. Cochran's expertise in traditional masonry also rests in his heritage in the Blue Ridge Mountains region where he was born and still lives today. In the 1700s many members of the Religious Society of Friends—Quakers—traveled west from Bucks County near Philadelphia to what is now Loudoun County, Virginia. Those who settled here—Janneys, Browns, Taylors, Hatchers, and more—built their homes, barns, mills, and meetinghouses with native logs, stone, and clay. Like Cochran, his team members live in the Blue Ridge area and also understand and have experience in traditional building methods. 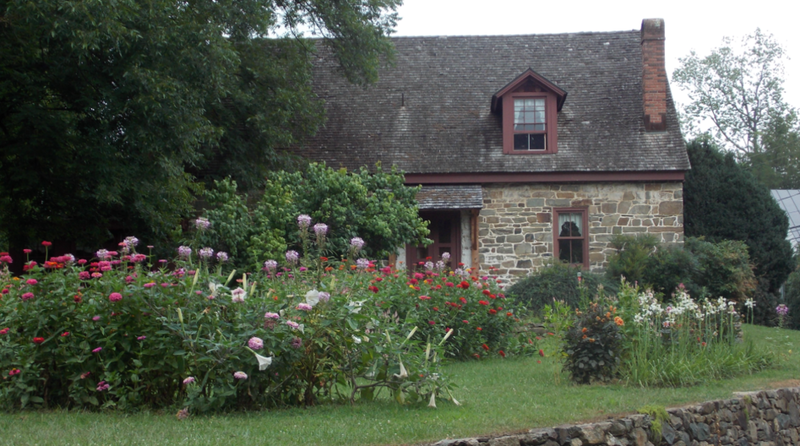 William Brown's family moved to Loudoun in the mid-1700s and settled in the Hamilton area. William Henry Brown, Will's great-great-great grandfather was a Loudoun stone mason. We have had the pleasure of working on some of his exceptional work. Stone masonry is in Will's DNA, and he is diligently preserving and teaching stone masonry at Cochran's. Mike Shockey is a Loudoun native who has over 30 years' experience in log and timber construction. Heading Cochran's timber division, Mike's attention to detail and understanding of traditional methods is what separates Cochran's from other masonry builders.